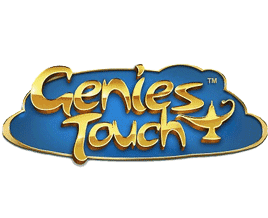 Where to Play Genie's Touch for Real Money? If you’ve ever seen Aladdin before, you’ll quickly realise that this slot has more than a passing resemblance to this famous Disney movie. The main hero of the story could almost be Aladdin’s twin, the princess is particularly similar to Princess Jasmine, and even the bad guy looks a bit like the one in the film. This blatant copying of the movie doesn’t prevent Genie’s Touch from being a really good one though, and the vibrant theme is one of the main reasons why so many players enjoy playing this slot each and every day. Whether you like the theme will depend on your own personal preferences though. The symbols on the reels are a mixture of the slot’s characters and brightly colored gemstones. The latter are not too original and don’t add much to the game, so it would have been nice if Quickspin Gaming had put some more effort into them. It doesn’t affect the enjoyment too much though, which is also enhanced by the sound effects played throughout your time at this slot. Overall, the theme at this slot really has to get the thumbs up, so why not head there today and have a few spins of the reels? 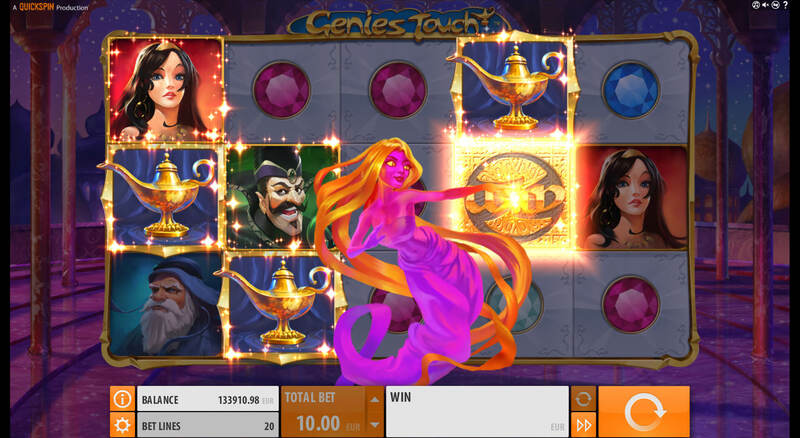 How to Play Genie's Touch Casino Game? 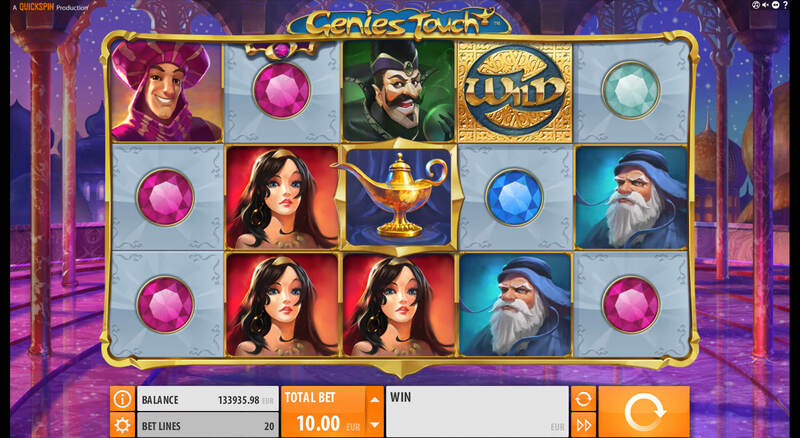 Playing the Genie’s Touch slot really couldn’t be any simpler. Firstly, the 20 paylines at this slot are fixed, so there’s no need to think about how many you want to play. You will need to decide how much to bet per spin though, which can vary from a minuscule 0.20 coins all the way through to a gigantic 100 coins. It’s always important to remember that the more you bet, the bigger the potential prizes will be. Equally important is not overstretching yourself though, as slots are supposed to be fun, and not cause financial issues. Once you’ve chosen how much to bet, you can start the reels spinning. When stopped, they could reveal that you’ve won a nice prize, or activated one of the bonus features (more on these later). It has to be said that the jackpot really isn’t the most impressive around, however winning it will still bring a smile to your face. Most wins are smaller ones though, although the base game can produce some nice ones from time to time. If you don’t win, there’s no need to worry too much though – simply spin the reels again and see if you get lucky next time! 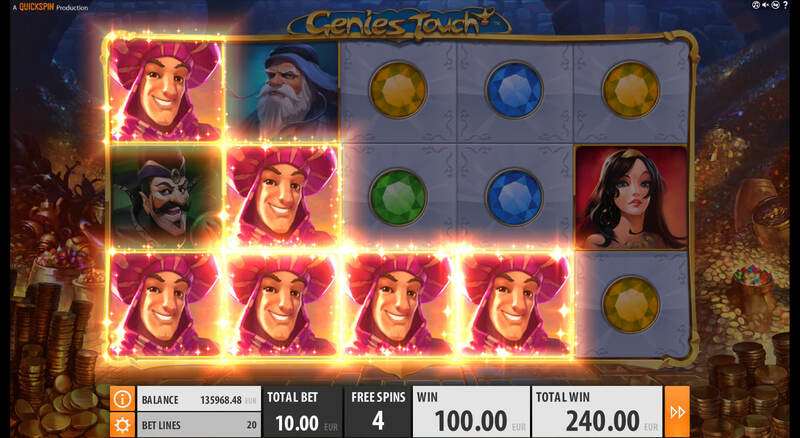 The 1001 Nights are a rich source of inspiration for slot game developers, and Genie’s Touch is Quickspin’s take on this ever-popular theme. You can expect gold, jewels, colourful attires and an intriguing atmosphere – without mentioning the high stakes and bonuses. Bonuses are an important part of most slots, and they can sometimes be their most exciting aspect. This is definitely the case when it comes to playing Genie’s Touch. 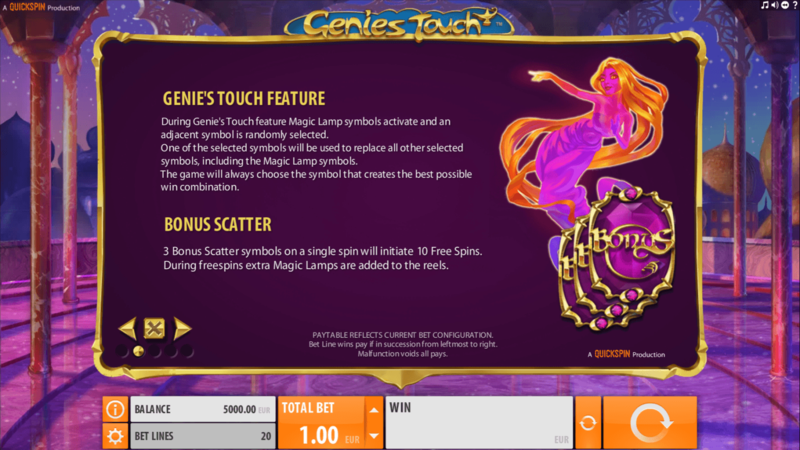 The first thing to say is, like most slots, Genie’s Touch has a wild symbol, which can be used to complete winning combinations. It is represented by the symbol with “Wild” written on it (quite predictably) and you’ll want to see it spin into view as often as possible. The first of the bonuses occurs when you land three or more of the genie’s lamp anywhere on the reels. When this happens, the genie will appear and turn a one symbol next to each lamp into matching symbols, plus the lamp will also turn into the same symbol. This will lead to at least six identical symbols on the reels, and therefore hopefully some nice prizes. The other bonus at this slot is started by landing three Bonus symbols anywhere on reels two, three and four. You will now receive 10 free spins, and during these there will be additional lamp symbols on the reels. This means more chances to trigger the previously mentioned bonus while the free spins are in progress. These free spins can lead to some particularly nice wins, so you’ll be excited when you activate them. There are no other bonuses or features at this slot, meaning that there is no Gamble feature. This is a good thing though, as most experienced players will ignore it anyway, instead preferring to keep the money they’ve already won. So, as you can see, there are some really nice bonuses and features at Genie’s Touch. Why don’t you head off to your favorite casino and have a few spins at this great slot today, and see if you agree with this review?